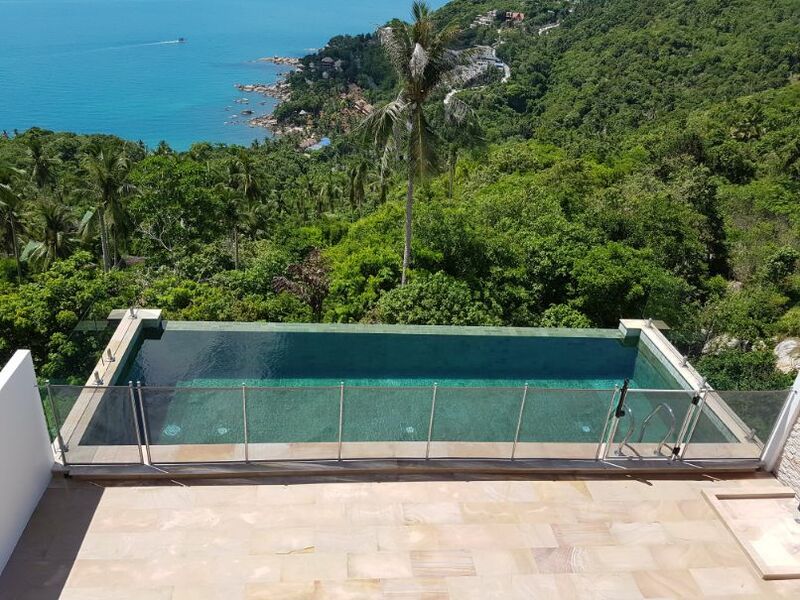 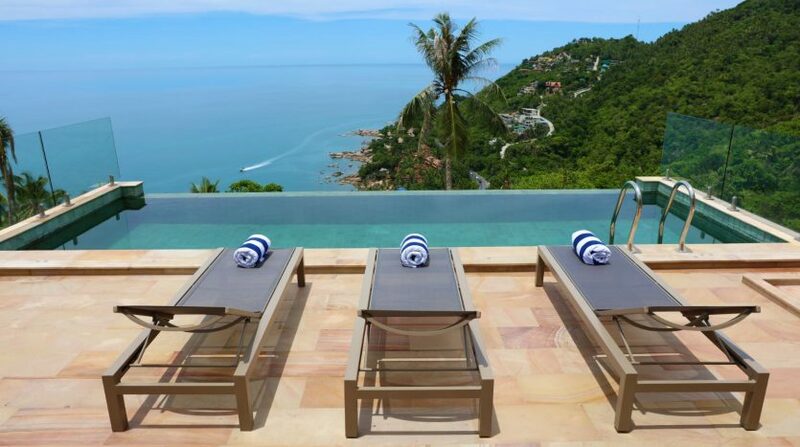 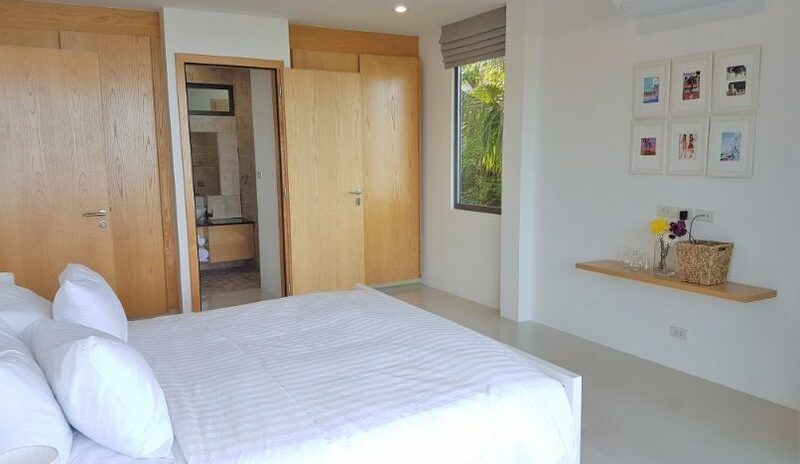 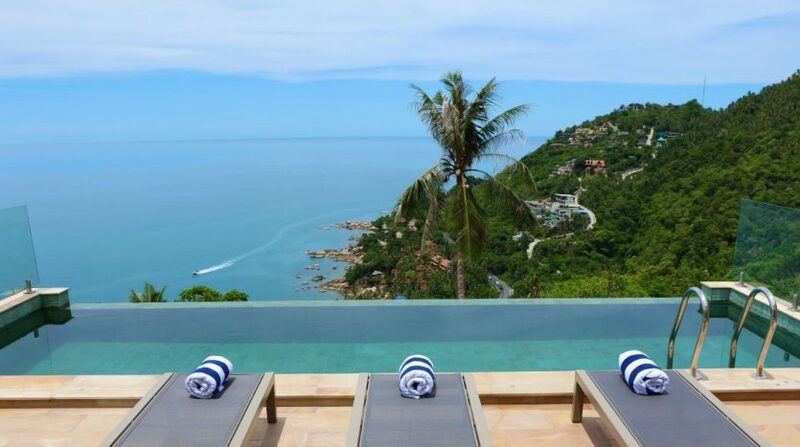 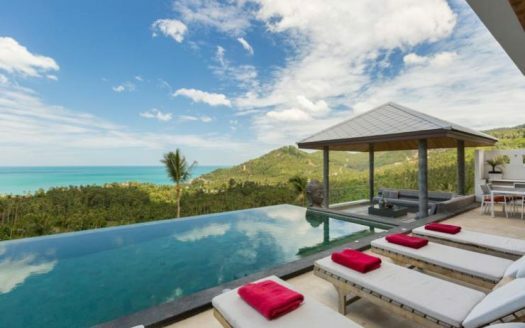 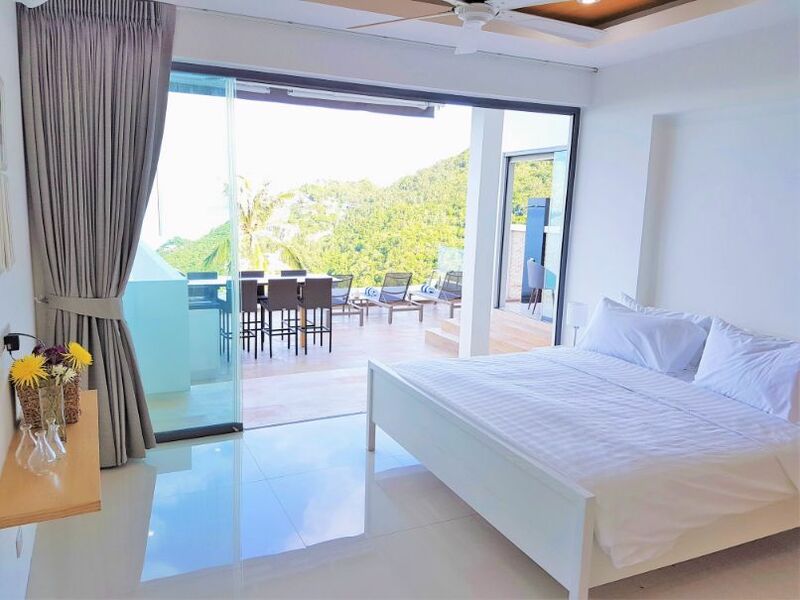 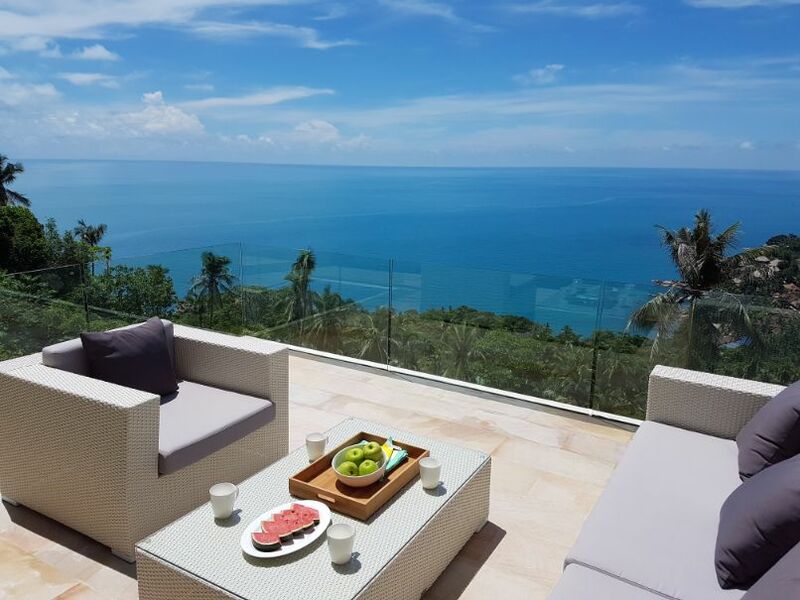 The Calvie is a newly-built 4 bedroom villa with infinity pool in Koh Samui, Thailand. 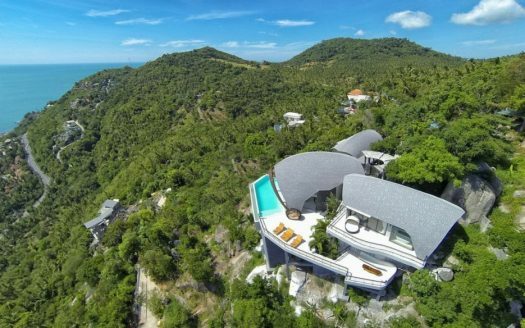 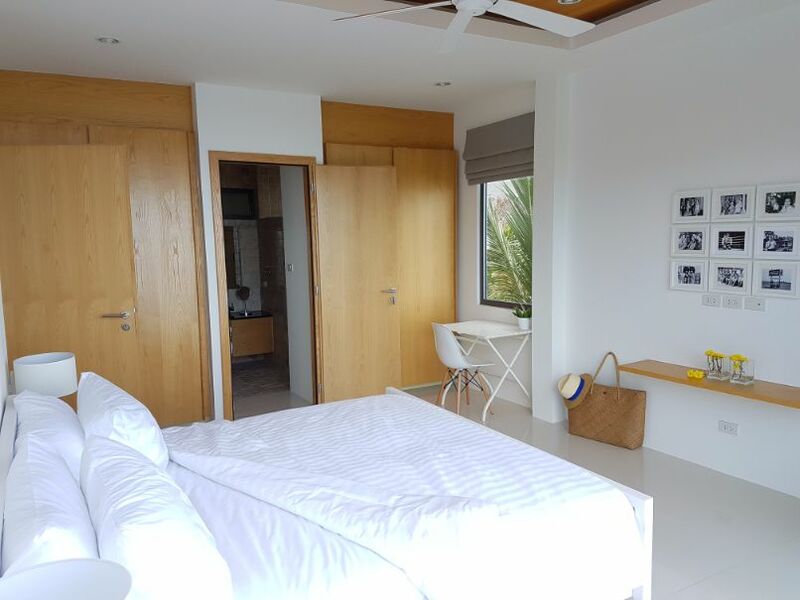 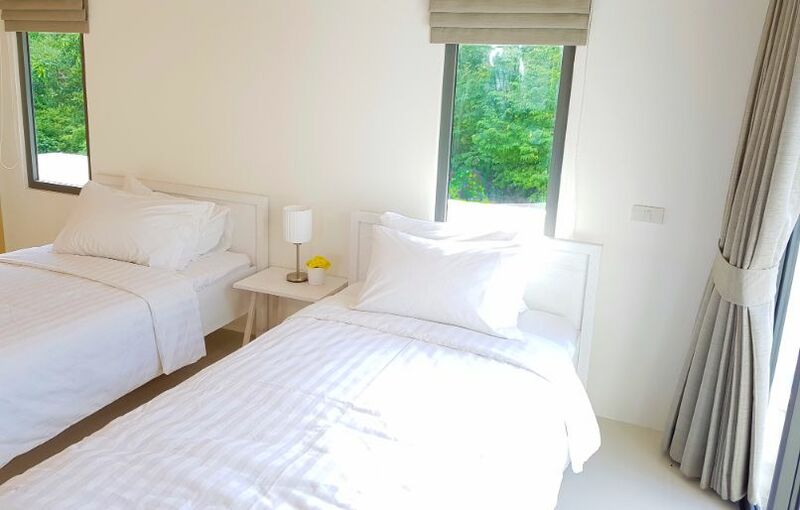 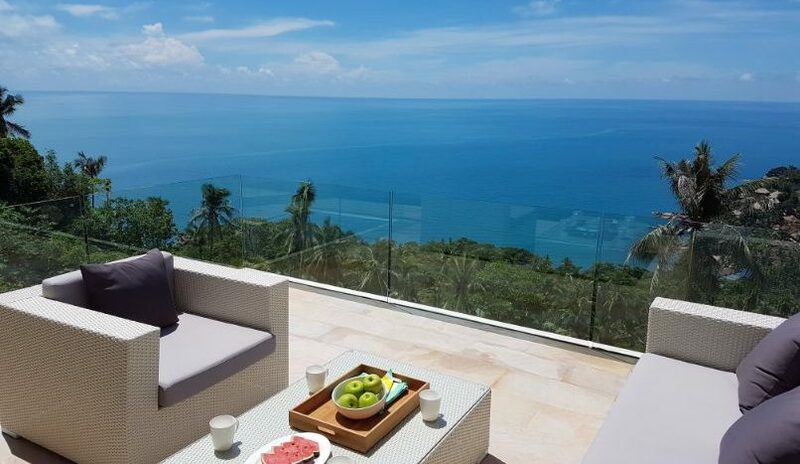 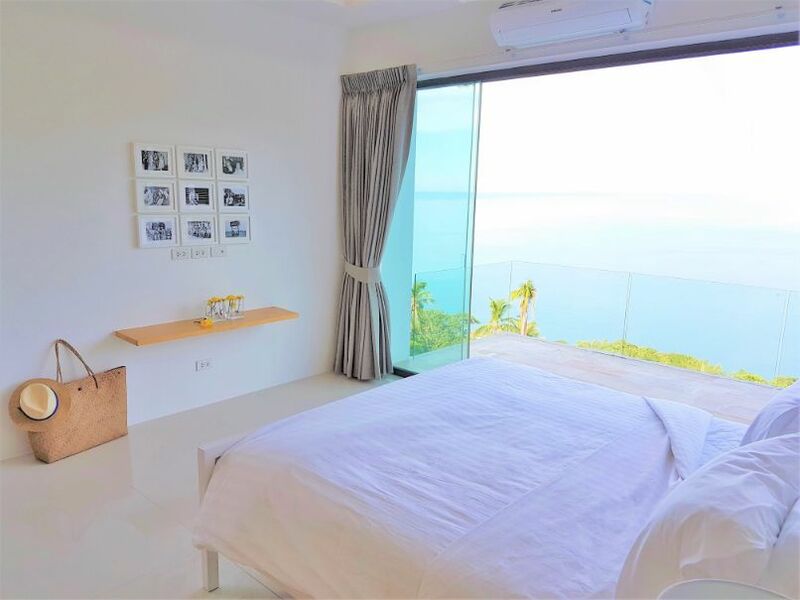 It is situated in the hills just 10 minutes outside of Chaweng amidst coconut plantations and with panoramic views of the Gulf of Thailand. 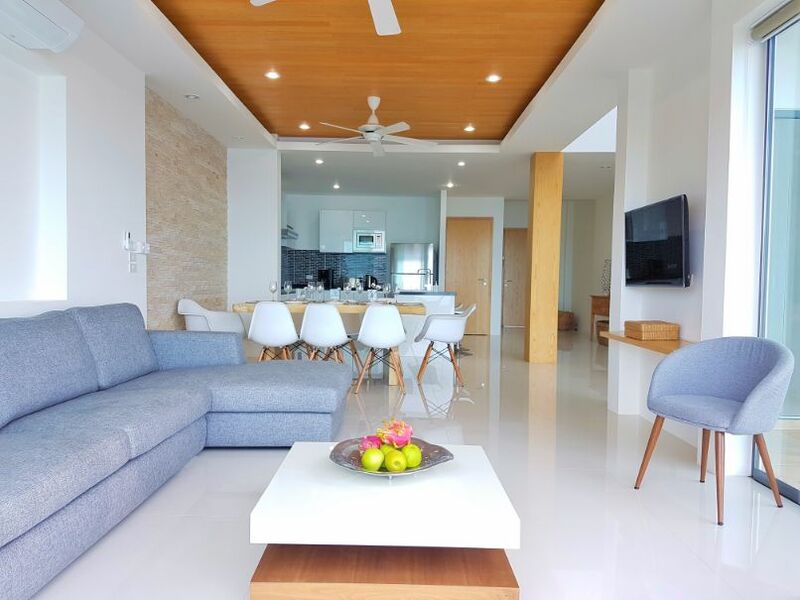 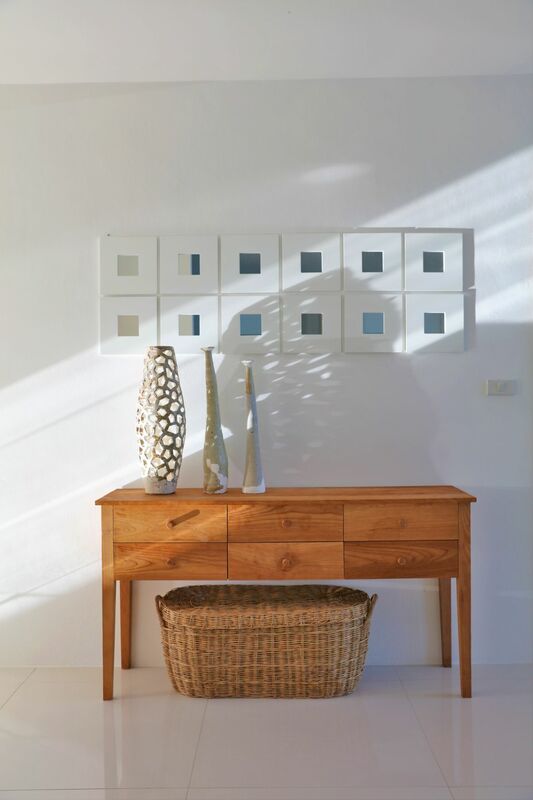 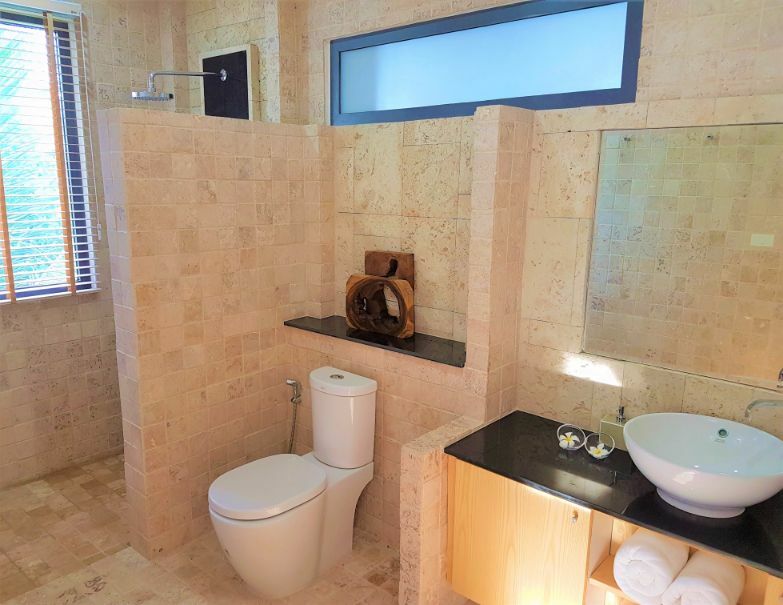 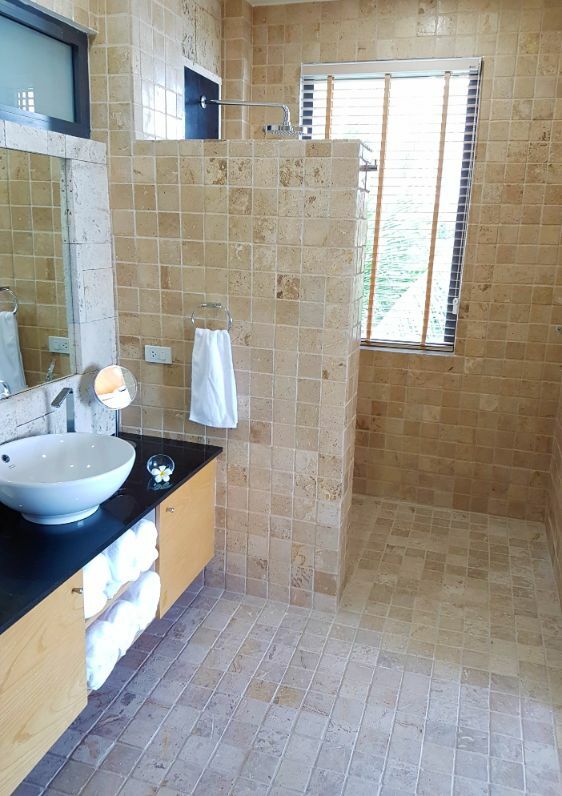 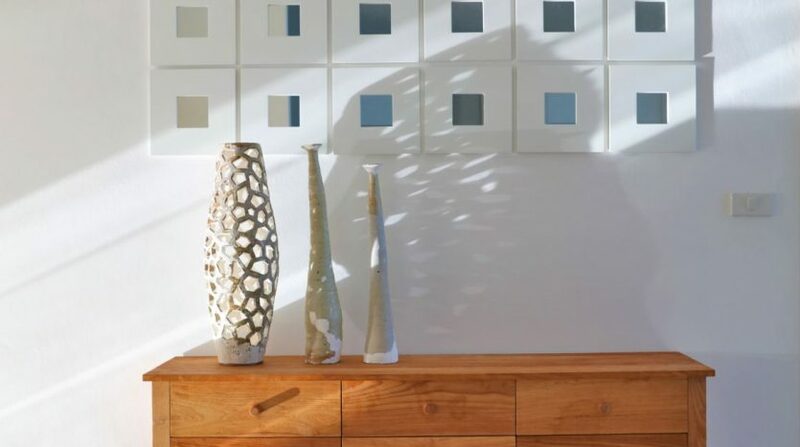 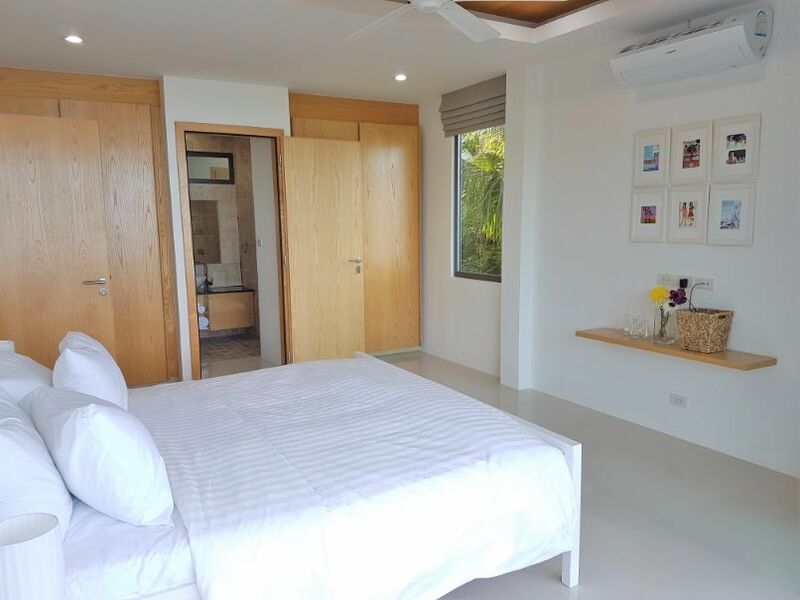 The Calvie is a contemporary villa that offers a private, relaxing and stylish setting to enjoy the tropical island. 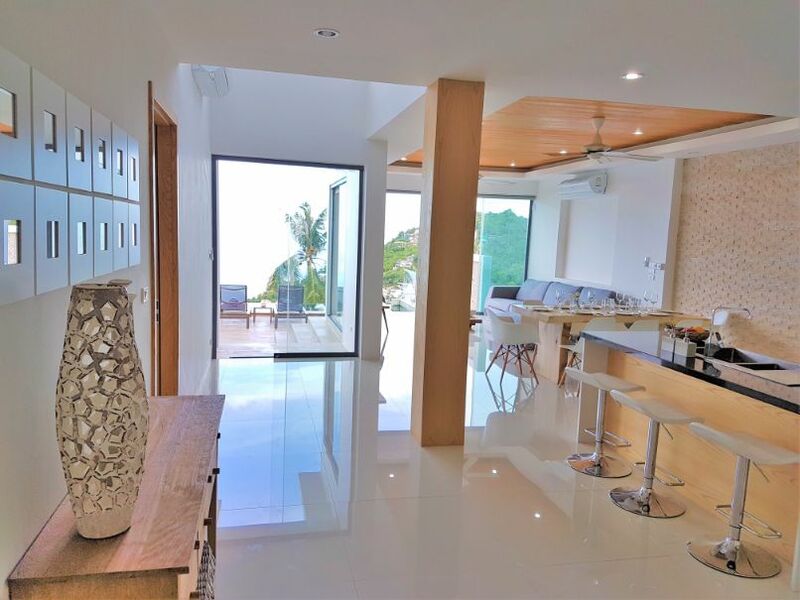 The layout of this villa has been carefully considered to provide stunning views throughout the 346 m² of indoor-outdoor living space. 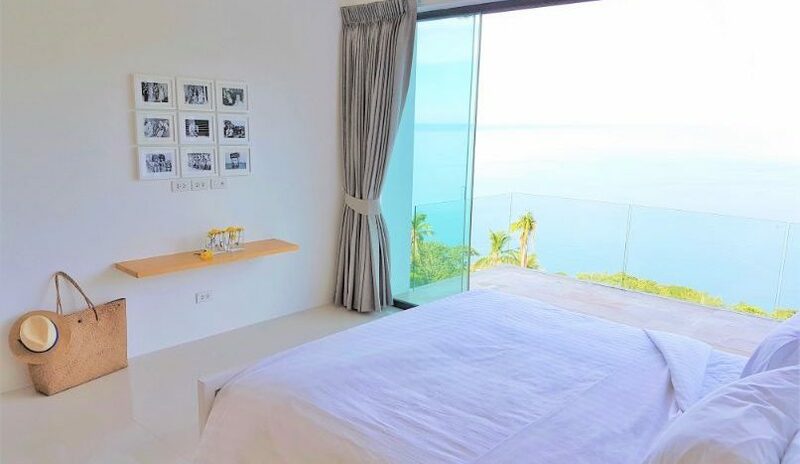 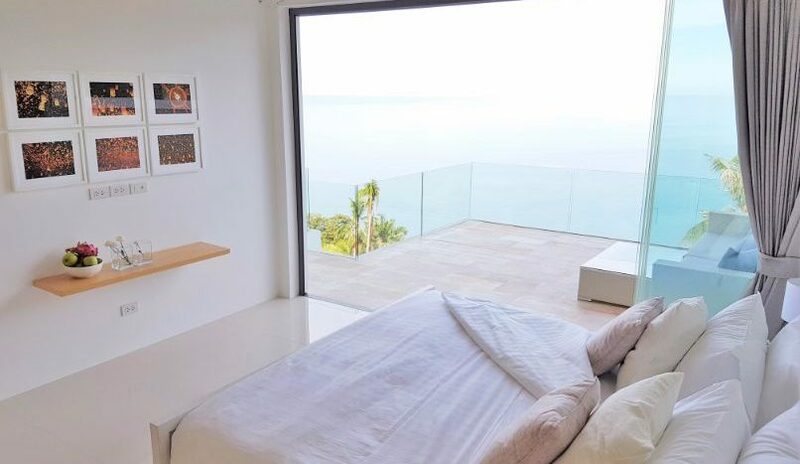 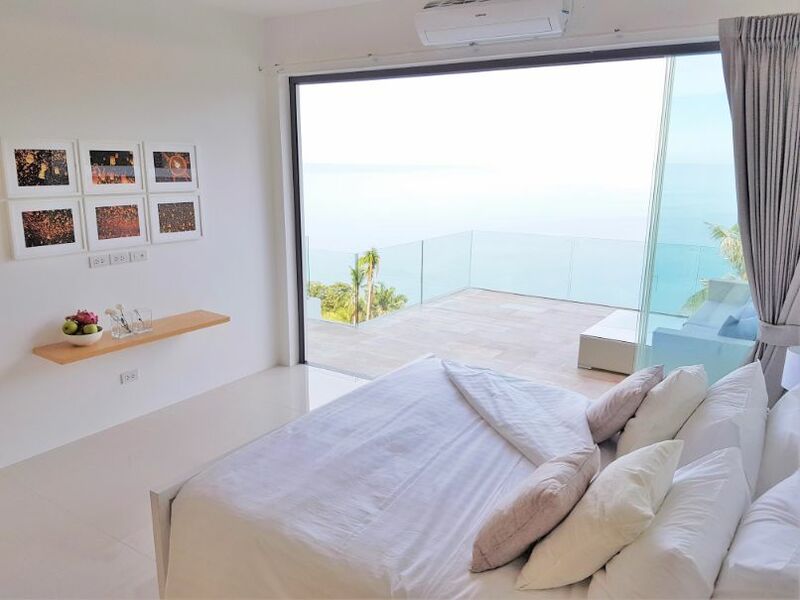 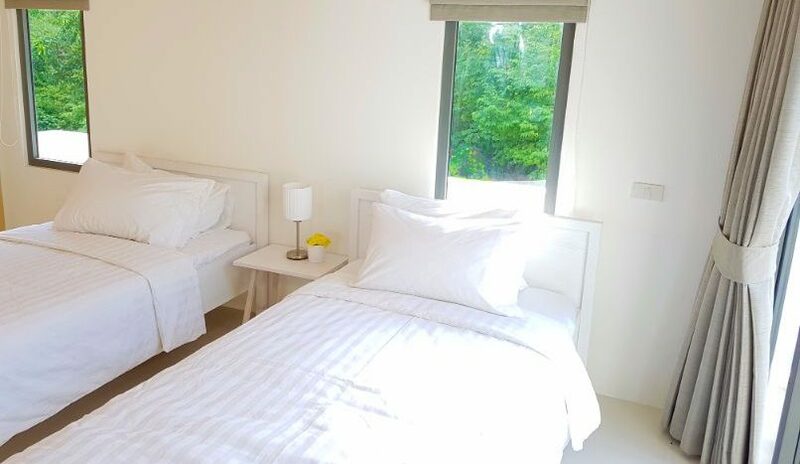 The bedrooms have sea views so you can wake up looking over the crystal blue water. 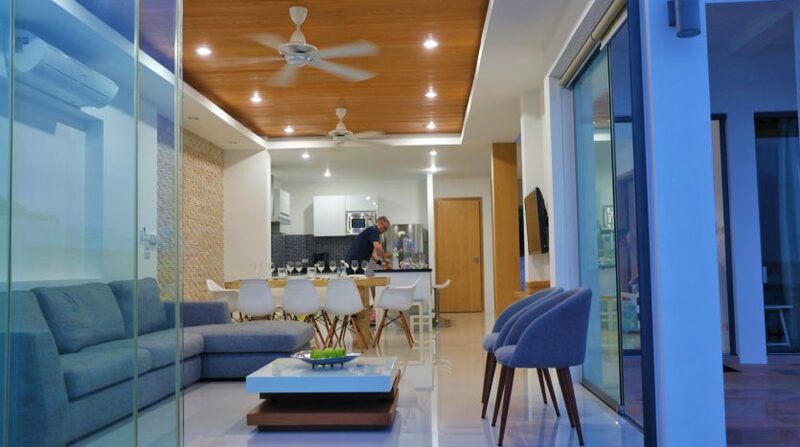 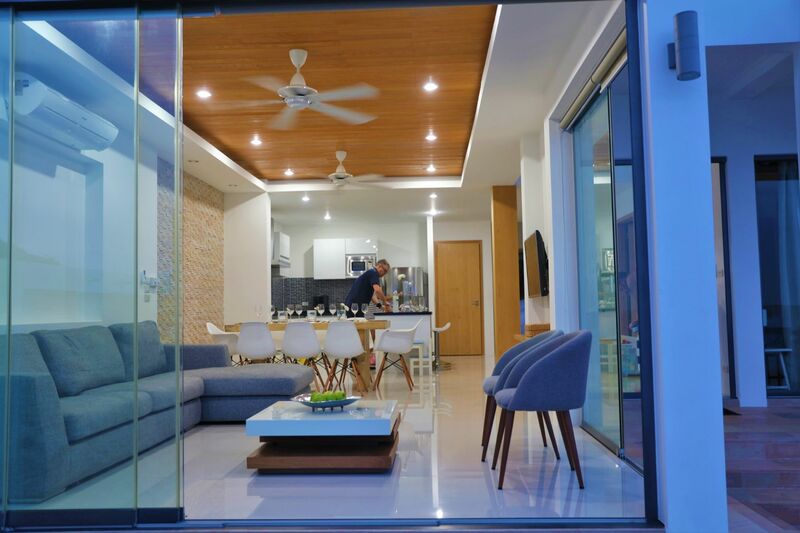 The open plan living, dining and kitchen areas have a relaxed minimalist decor and each room has large floor-to-ceiling sunflex glass doors that can be drawn back to allow open access between the indoor and outdoor living areas. 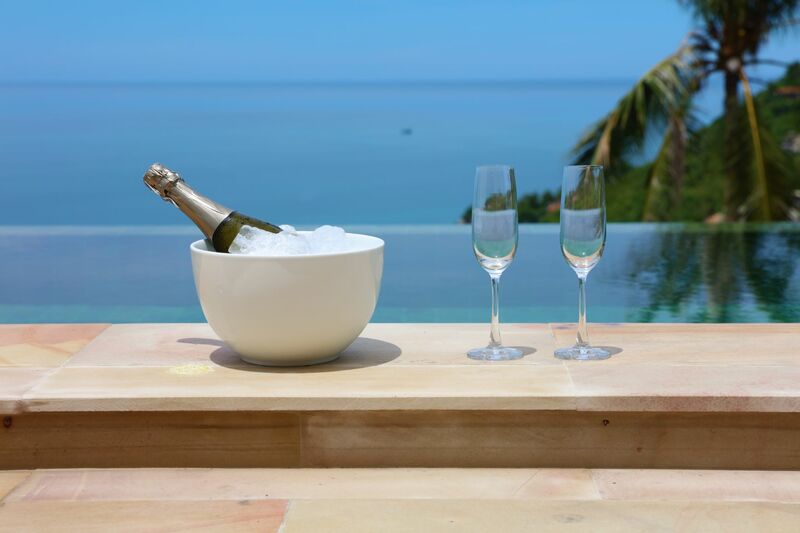 Kick off your sandals and enjoy the large deck surrounding the infinity pool, complete with sun loungers, BBQ and outdoor bar. 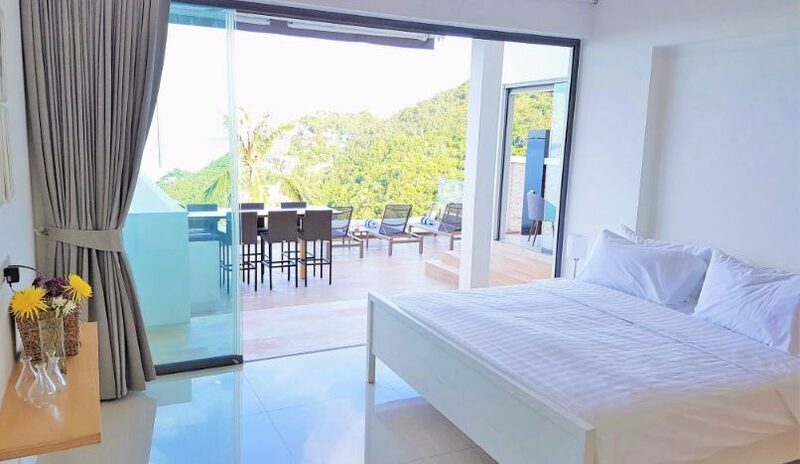 Each bedroom has its own balcony for individual downtime. 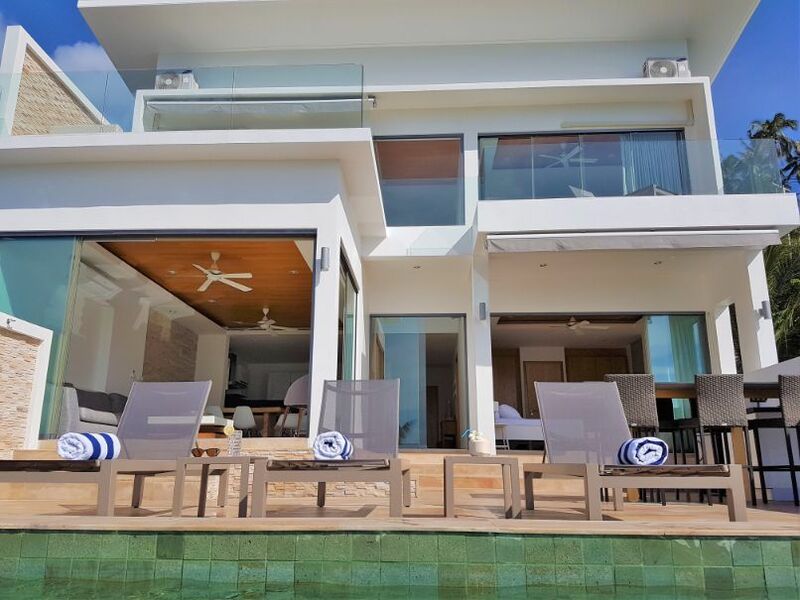 There are also retractable awnings over the pool deck and upper balcony to provide shade for those that do not like to be directly under the sun. 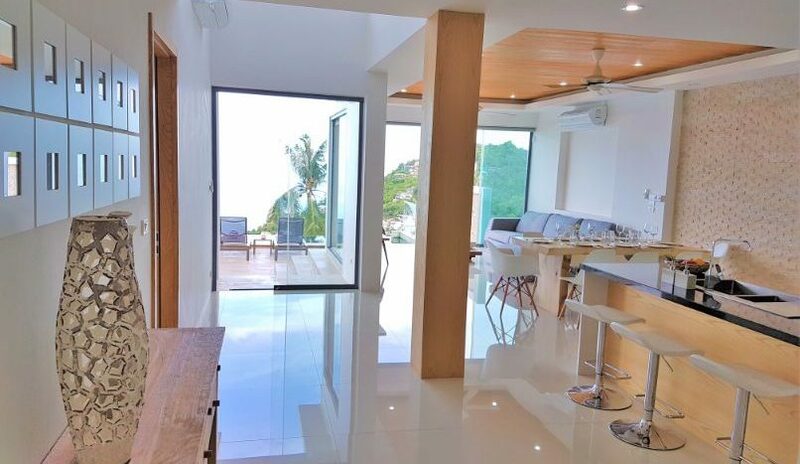 The open plan kitchen is fully fitted with all necessities. 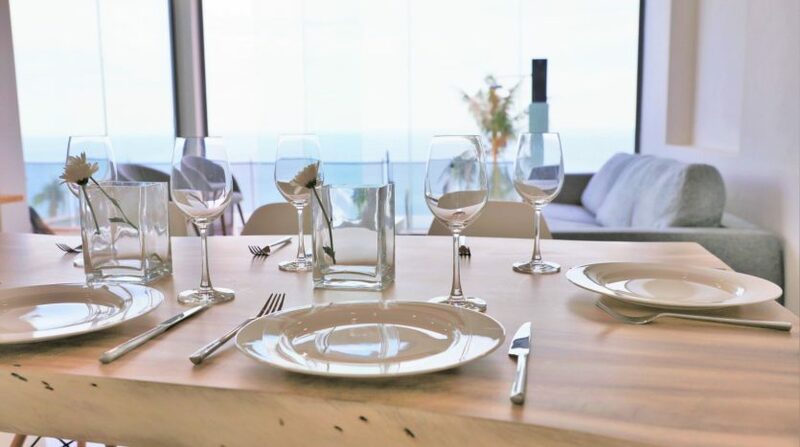 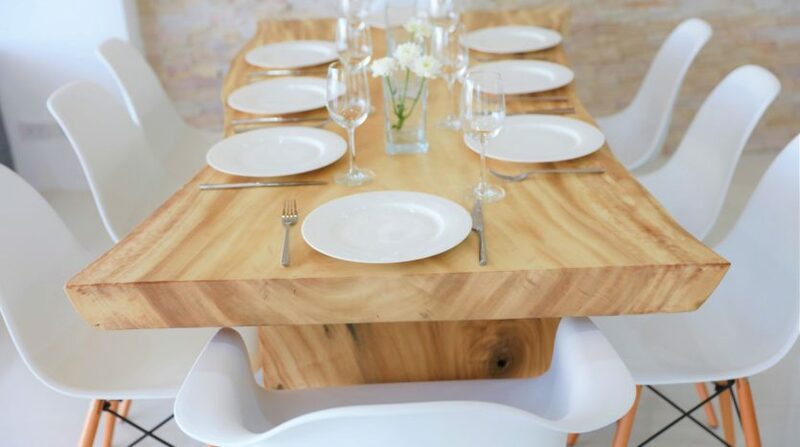 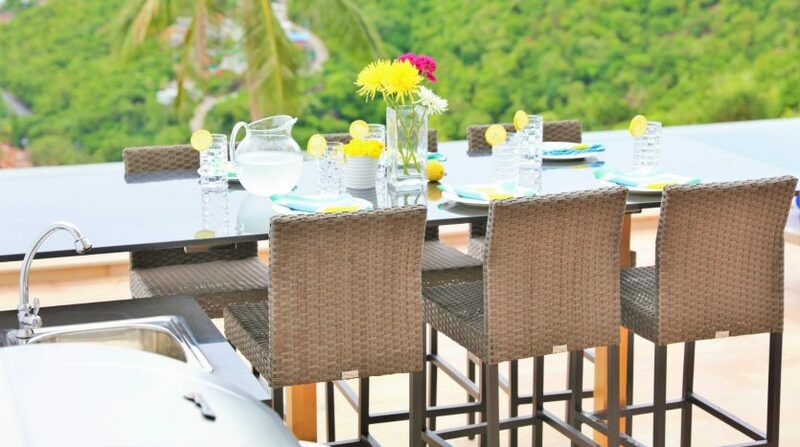 The villa boasts indoor dining with uninterrupted sea views, and alfresco dining at the poolside casual dining area. 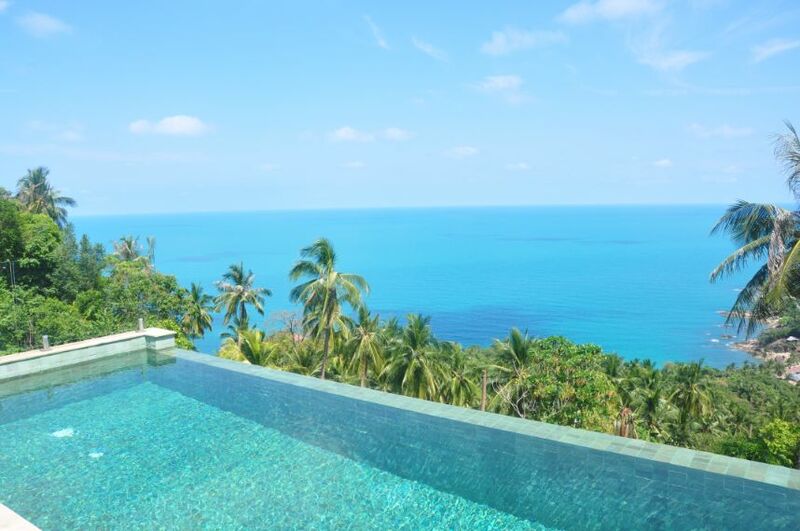 The central feature of the villa is the 35m² private infinity pool with green Sukabumi Balinese tiles overlooking the the azure waters of the Gulf of Thailand. 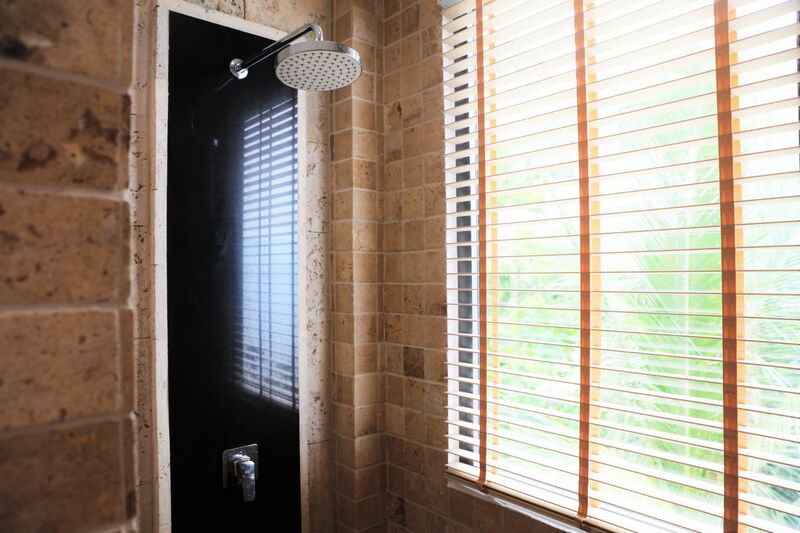 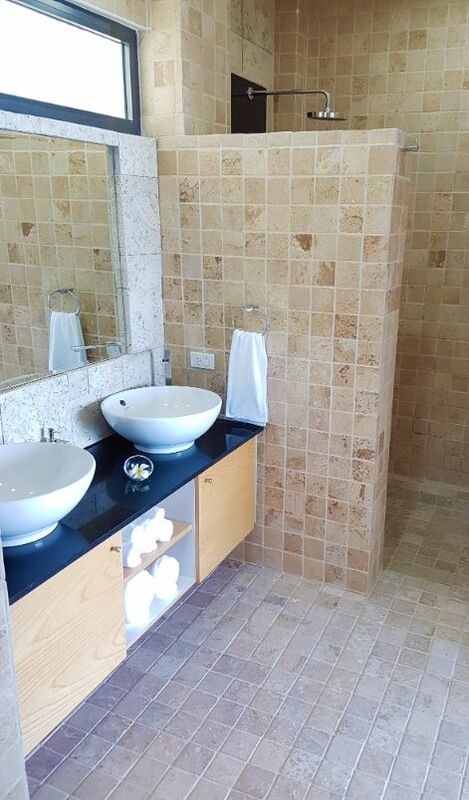 Also on the pool deck is an outdoor shower – a great place to refresh after a day exploring the island. 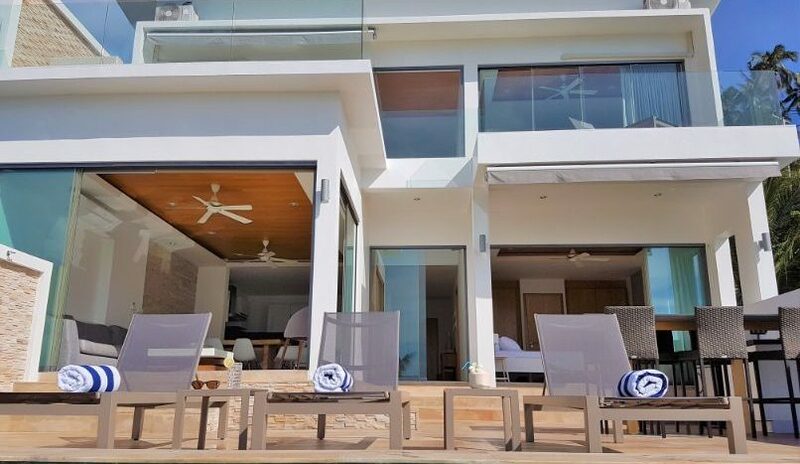 The villa contains 4 spacious en-suite bedrooms with floor to ceiling glass doors that open onto the pool area or private balcony. 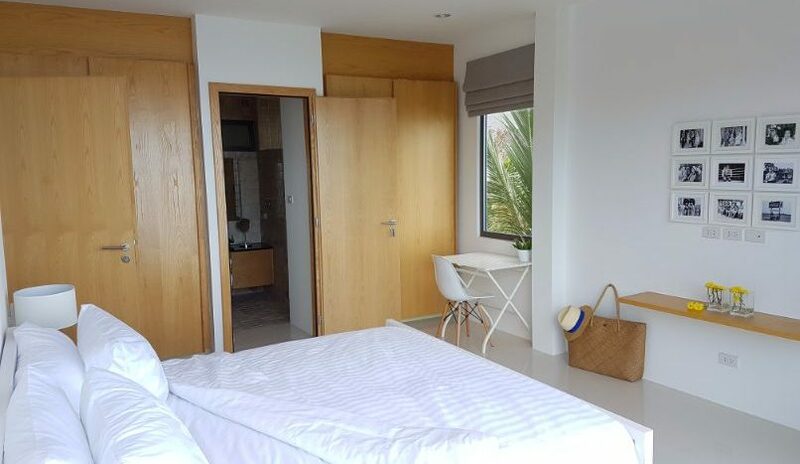 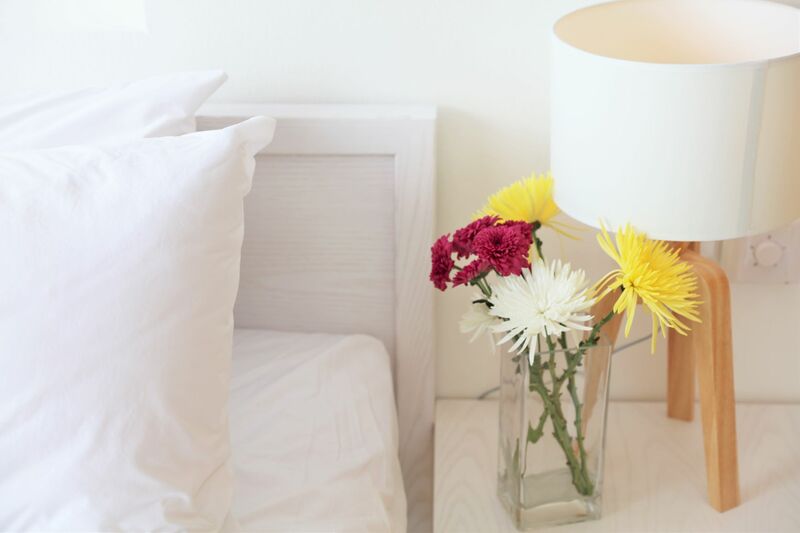 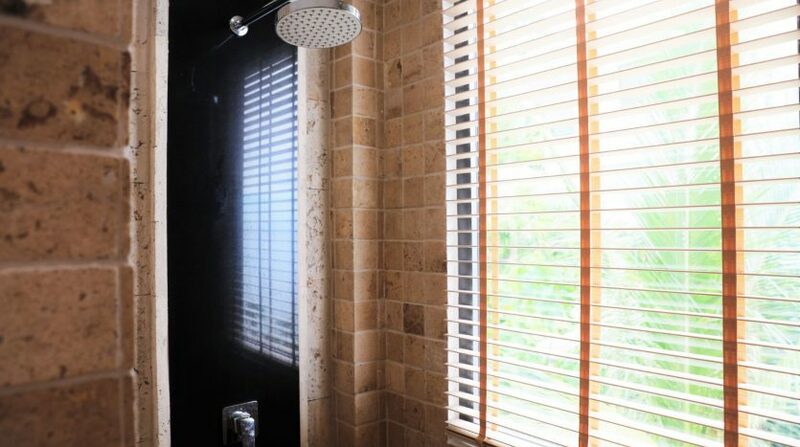 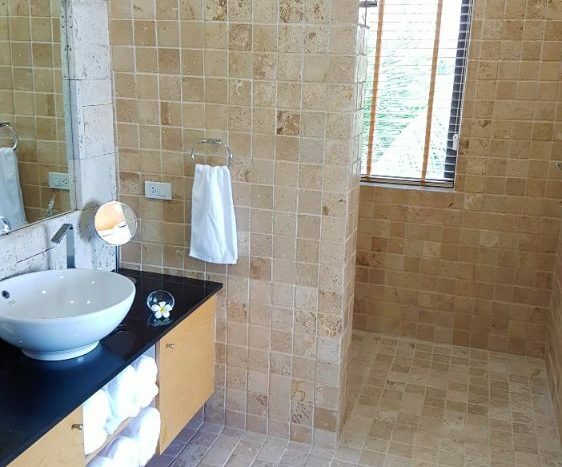 Each room has crisp white linen, built in wardrobes and an en suite bathroom with rain shower. 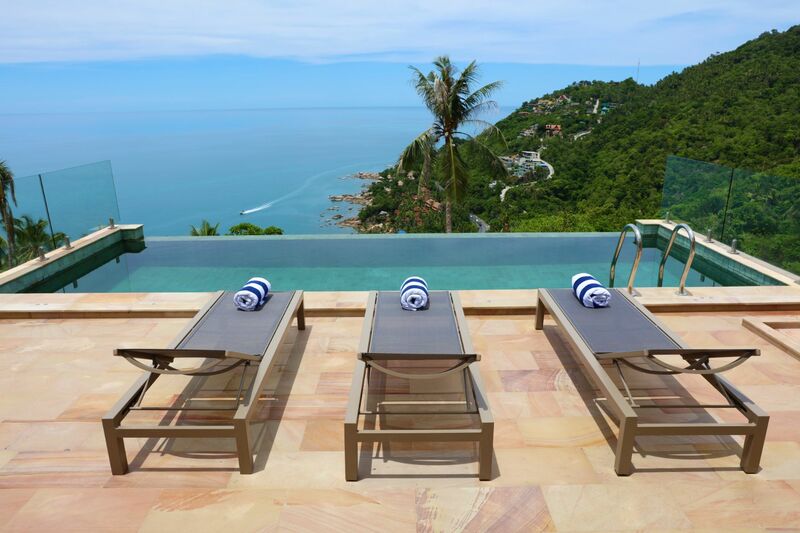 The Calvie is nestled in the stunning hills of Chaweng Noi, which has become known as the “Beverly Hills” of Koh Samui. 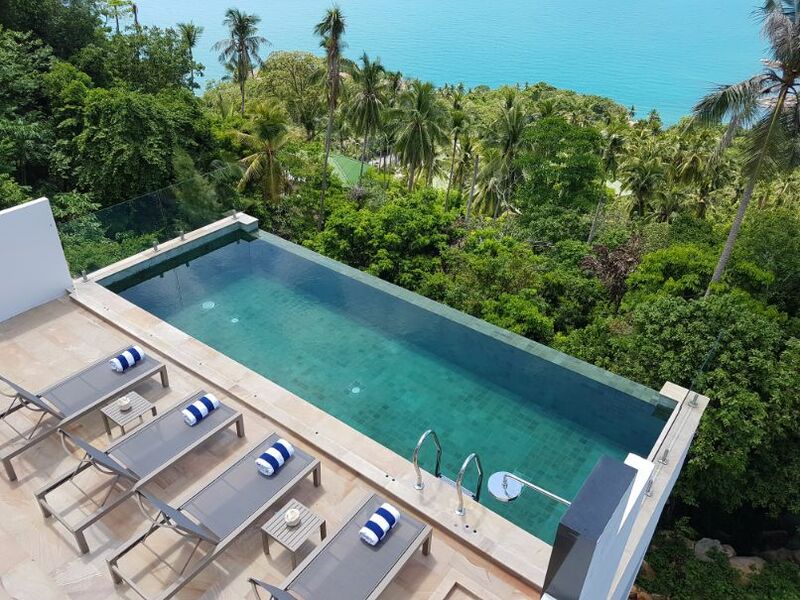 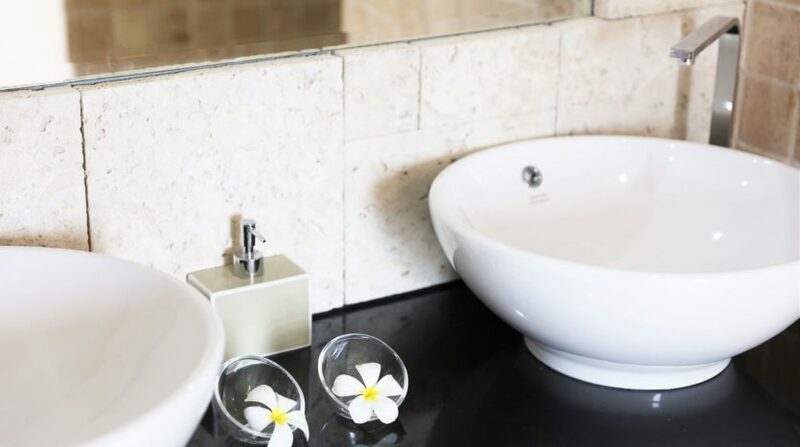 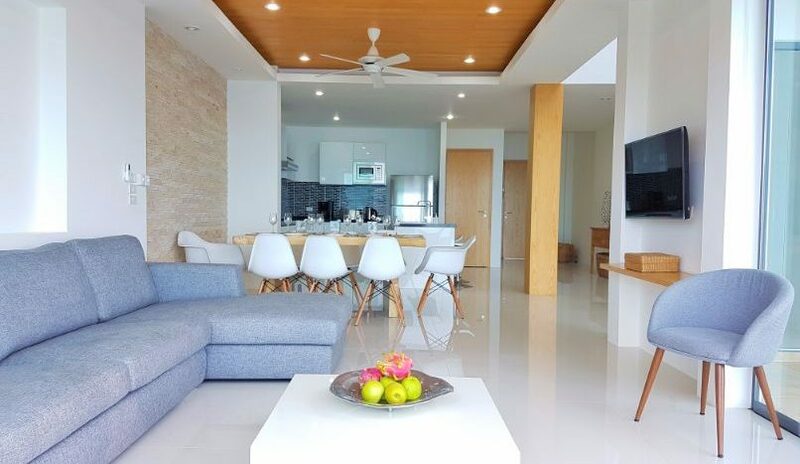 The villa is just a few minutes’ drive down to beautiful Chaweng Noi beach, which is one of the island’s most beautiful bays and is lined with luxury hotels and a fabulous beach club. 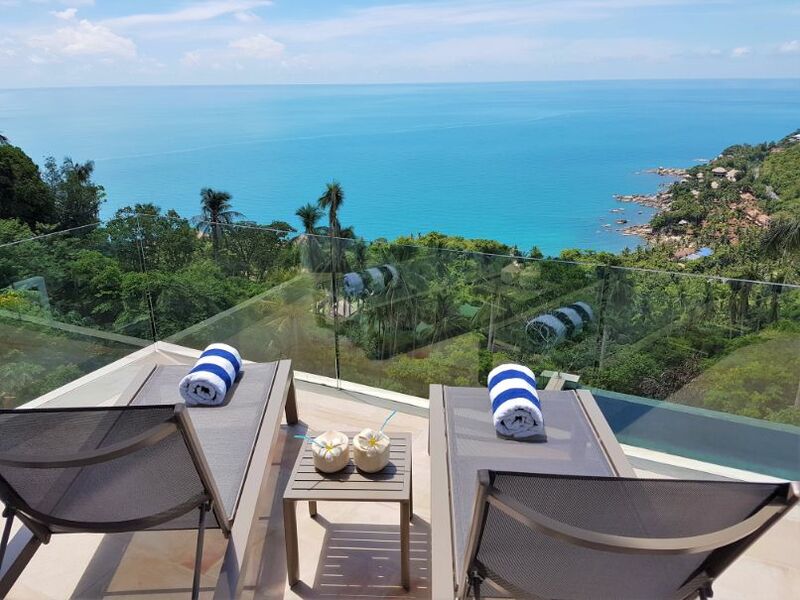 The hustle and bustle of the bars and restaurants of either Chaweng or Lamai are less than a 10 minute drive away, as is Central Festival, Samui’s premier shopping mall. 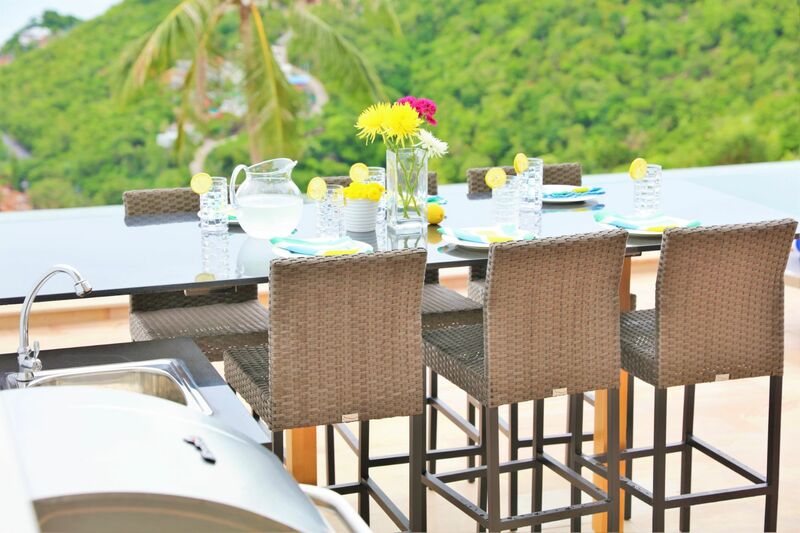 The hills above the villa feature the famous Jungle Club and its highly rated restaurant only 5 minutes away. 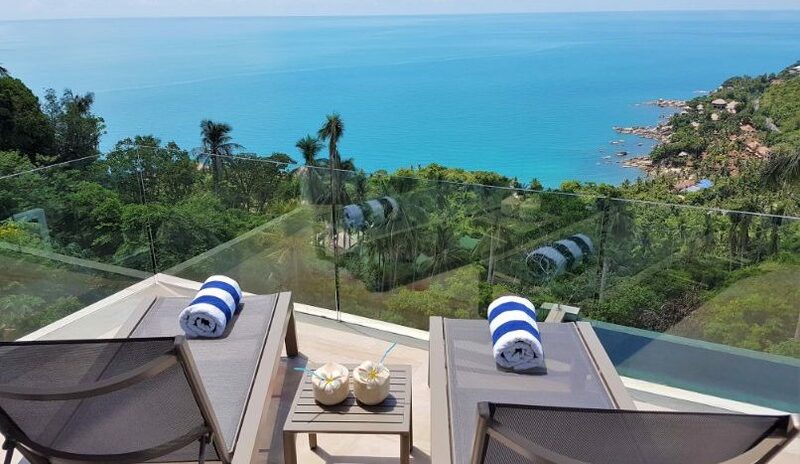 For golfers, Royal Samui Golf & Country Club is only 5 minutes drive away and the spectacular Santiburi Golf Club is also easily accessible. 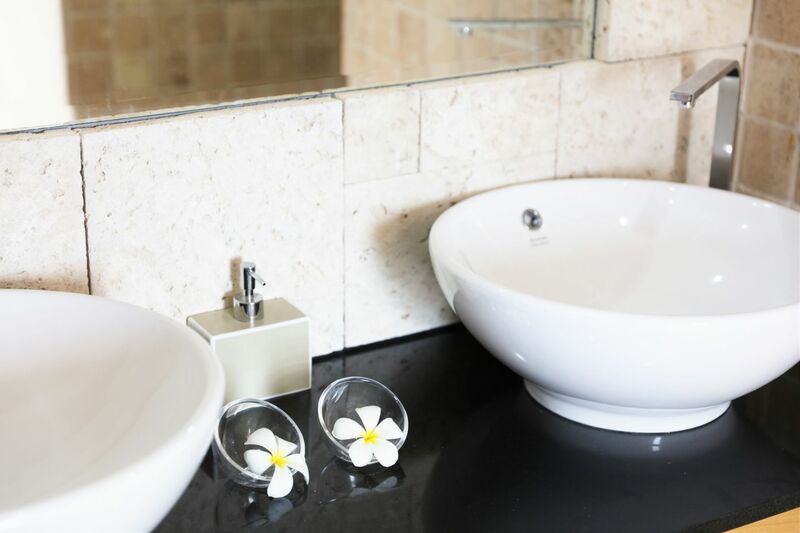 We have already done the research and will provide you with a helpful guide to our favourite places in the area. 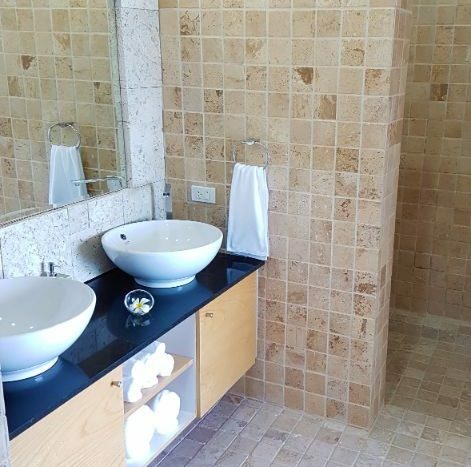 The owners of The Calvie have a young son so they understand the importance of having some kid friendly comforts on holiday. 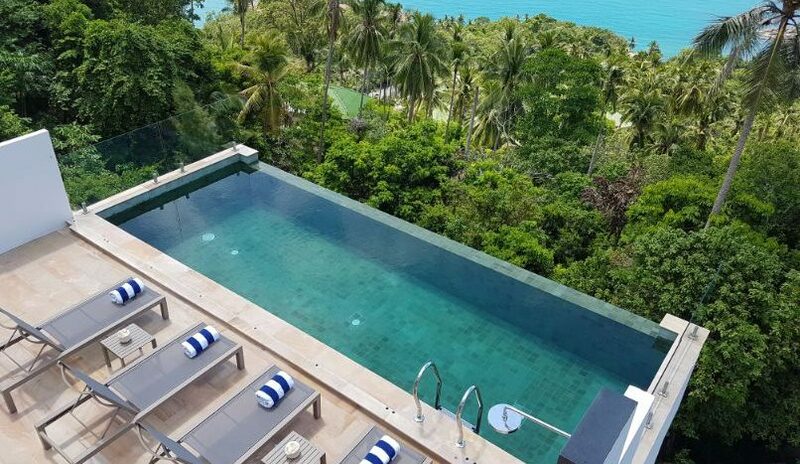 Most importantly the villa has a pool fence that can be easily installed if requested – that way even parents can relax on holiday. 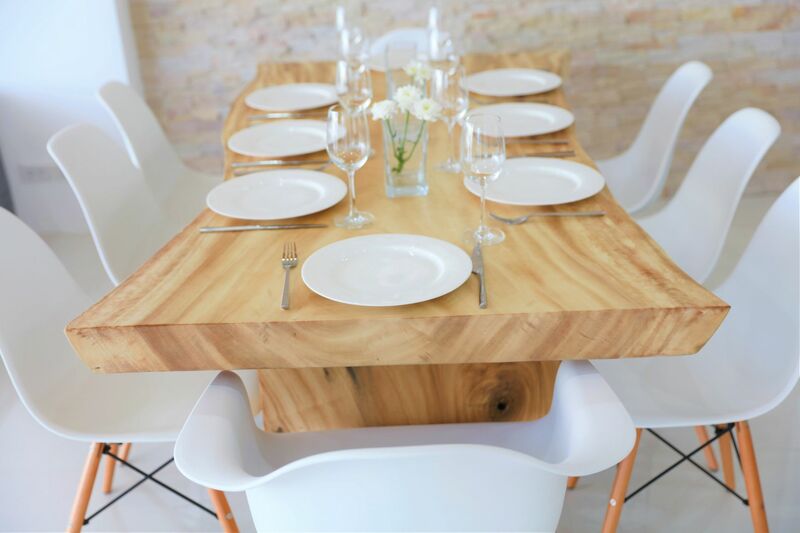 We have a cot and high chair available on request and free of charge. 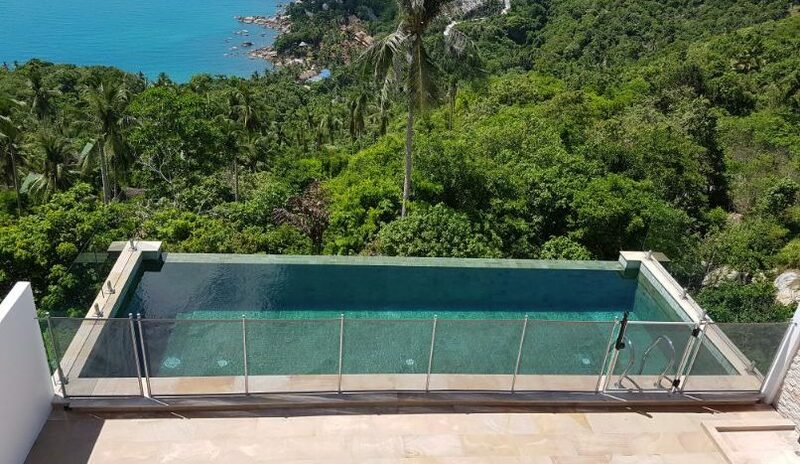 We also have gates available for the stairs. 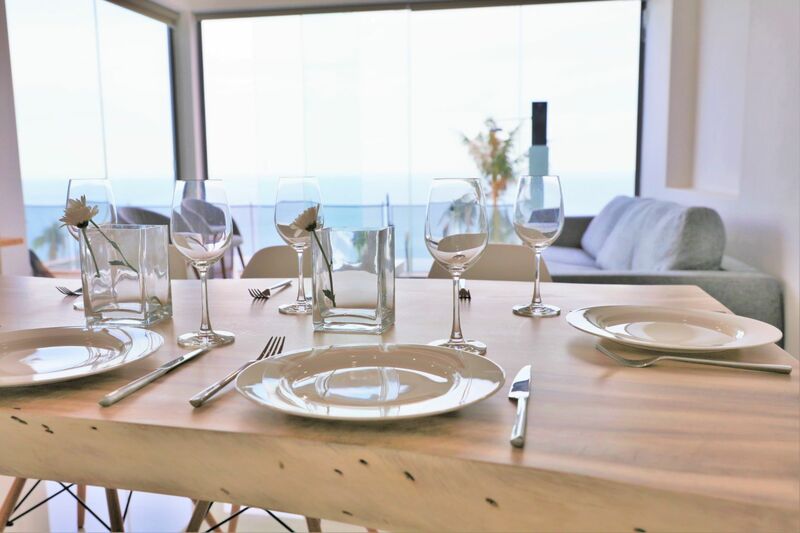 At The Calvie we can help you with recommendations for spa treatments, taxis, car rentals, delivery of food to the villa from amazing local restaurants or arranging an in-house chef. 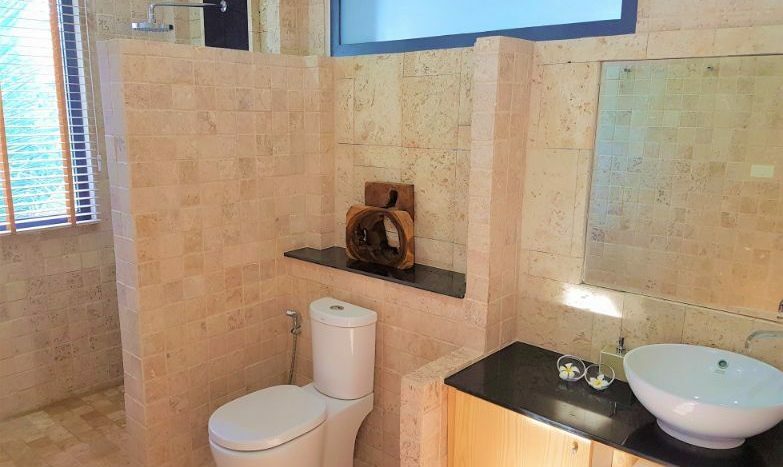 Please just let us know what you need. 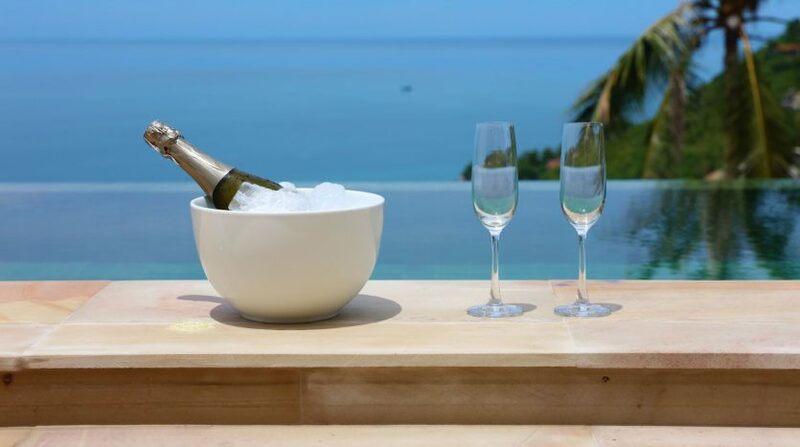 All we ask of you is to relax and enjoy your holiday. 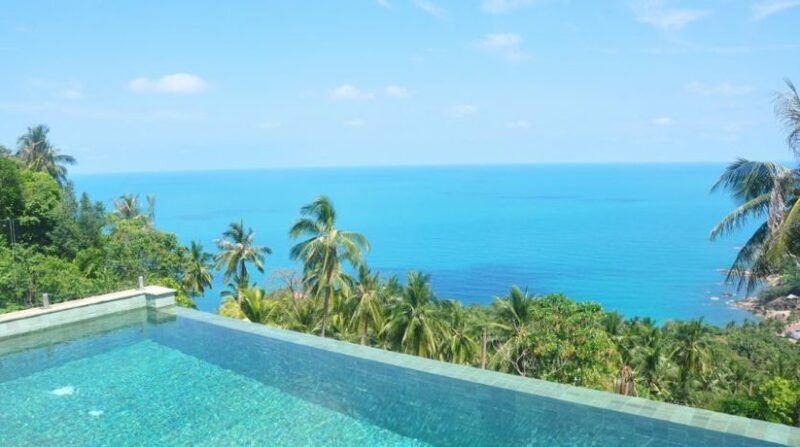 We will provide your transport from the airport to the villa on your arrival in Koh Samui. 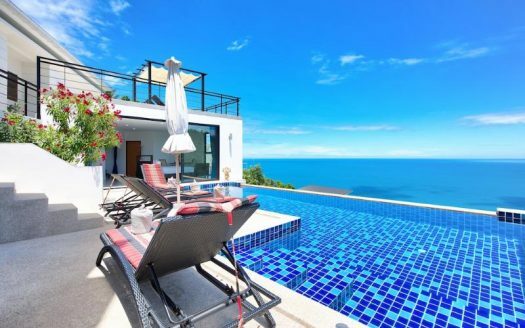 Price: $ 350 / day min.